Surgical - Universal Eye Care, Inc. Established in 1993, Universal Eye Care, Inc. offers a wide range of state of the art surgical products from companies such as Alcon, Bausch & Lomb, AMO, Zeiss, Leica, Haag Streit, Ellex, Nidek, Quantel, and many more. Our technicians examine and evaluate of each piece of equipment to insure that it arrives patient ready. We secure each product for shipping with the best packaging materials and methods available. Our shipping partners can accommodate more than 100 international destinations. Used primarily for Cataract and other Ophthalmic procedures, this scope is also designed to be used for other disciplines, such as Hand/Plastic surgery. It has removable optical components that allow for a face to face bridge. The MDU delivers a very consistent red reflex and great Zeiss optical clarity. The S5 microscope is a compact, manually balanced stand that preceded the S7. An ophthalmic surgical microscope with its crisp, sharp OptiChrome™ optics gives the surgeon natural color, outstanding depth-of-focus and higher contrast for maximum detail recognition. Leica’s direct halogen illumination system allows the surgeon homogeneous illumination to see crisp images even at low light levels, and provides a stable red reflex. The jalousie, operated in sterile conditions, optimizes this reflex by generating the perfect illumination with optimum contrast and depth-of-field. Many consider this the finest eye microscope ever made. The venerable 690 was the first unit to offer all the modern upgrades in one package. The system is foolproof and problems are easily diagnosed. The modular construction of the unit ensures a quick turn-around on downed components. This system won’t let you down. Designed for ophthalmic surgery in surgical centers, clinics, and hospitals MÖLLER ALLEGRA 900 is very compact. Due to tilt and light management it may also be used for ENT or reconstructive procedures. The Leica M844 F40 belongs to the premium class of ophthalmic surgical microscopes and offers optimal solutions particularly for posterior and high-end anterior segment surgery. Combined with the Leica M844 APO OptiChrome™ optics and direct halogen illumination, the system offers the best clarity, contrast, and sharp, true anatomical color images at safer low-light levels. The result: a safer linkage between the diagnostic and surgical image. Features, such as the QuadZoom™ technology, the Double Wing Assistant Bridge, and HD recording – exclusively available from Leica Microsystems – make it furthermore the ideal microscope for Teaching Institutes and University Hospitals. Although the 6-S microscope has not been manufactured new since the 90’s, it has always been reliable both in optical clarity and with enhancing the red-reflex. The technology was applied to the newer Visu series because of it’s simplicity and performance. 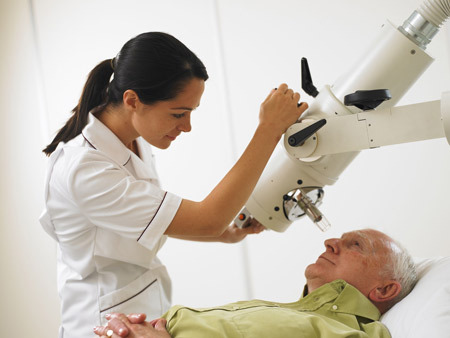 This system is one of our least expensive options for eye surgery and is an excellent value. The Visu series from Zeiss for the S7 floorstand include the Visu 150, Visu 160, and Visu 140. These microscopes are virtually indistinguishable from one another in their optical performance and physical appearance. The 140 and 160 are the newer of the series and the main difference is that they have less optical adjustment options. Any of these models would be a good choice for cataract surgery. The S7 is a compact, manually balanced and locked floor stand. The ACCURUS® Surgical System provides the control and convenience needed for combined cataract and vitreoretinal surgeries in one convenient machine and a single cassette/pak. Optimize cataract surgery outcomes with the INFINITI® Vision System. Now featuring OZil® Intelligent Phaco software upgrades, the INFINITI® Vision System puts optimized OZil® torsional emulsification at your fingertips. With enhanced fluidic management and surgical control, the INFINITI® Vision System delivers the strategic advantage in customized phaco procedures. The WHITESTAR Signature® System is a modular ophthalmic microsurgical system that facilitates anterior segment (cataract) surgery. The WHITESTAR Signature® System represents a breakthrough in easy lens removal technology, from the company that has pioneered virtually every major breakthrough in phaco emulsification in the past two decades. Only the WHITESTAR Signature® System combines the safety of revolutionary FUSION® Fluidics with the optimized cavitation of WHITESTAR® Technology. The integration of these technologies creates the versatility needed to remove both hard and soft lenses. The Millennium™ Microsurgical System delivers on the promise of a platform with innovative technology. For the latest advancement in fluidics control for the cataract surgeon, Bausch & Lomb Surgical offers Millennium Advanced Flow System (AFS) and Custom Control Software (CCS) which take you beyond cold phaco with a new hyper-cool level of control with your choice of either a venturi or peristaltic system. The Dual Linear control feature allows for simultaneouscontrol of either flow or vacuum, and ultrasound power. Additionally, surgeons can use both flow and vacuum response in the same procedure. The powerful Quad-crystal ultrasound handpiece delivers excellent cutting with smooth efficiency. Programming options allow for virtually unlimited parameters of storage and surgeon-controlled mode switching. With its modular design, the Millennium system integrates innovation for today and the future. The Premium Platform For Advanced Lens Surgery. The Stellaris Vision Enhancement System is designed to complement your surgical technique and exceed your patient’s expectations. It enables sub-2 mm lens surgery through a flexible, hybrid approach to fluidics and advanced, ultra-efficient cutting dynamics. The D.O.R.C. Associate® is an advanced ophthalmic system that integrates both a Peristaltic and Venturi pump, allowing surgeons to independently select either pump mode for Phaco or Vitrectomy procedures. The key feature of this futuristic system is a microprocessor-controlled vacuum system that measures in-line vacuum pressure, ensuring precise and linear vacuum control in combination with High Vacuum Occlusion Technology for advanced capsular protection. The High Vacuum Sensor Cartridge is used for all procedures, providing an optimal sterile barrier, so no contact with non-sterile liquid is possible. The D.O.R.C. Associate® has the most compact design of any microprocessor-controlled ophthalmic surgical system, with easy to learn color touch screen, voice supported functions, and a wireless remote control for optimal flexibility.Laser Phaco and Vitrectomy prepared. The Lumenis Selecta® Duet™ represents the industry’s most advanced anteriorsegment laser, combining the advantages of YAG photo disruption capabilities along with the innovative Selective Laser Trabeculoplasty (SLT) technology, which was developed and brought to market by Lumenis. The Aura® PT™ Ophthalmic YAG Photodisruptor Laser System represents the latest YAG product offering from Lumenis – the market leader in ophthalmic laser technologies. The preferred product for anterior-segment procedures such as laser iridotomy and capsulotomy, the Aura PT includes advanced specifications which make treatment fast and accurate for superior patient care. Ideal for eye surgery, the Hill-Rom Surgical Stretcher (also referred to as an eye stretcher) offers outstanding mobility, functionality and quality. A surgical rail allows for easy attachment of gas delivery and drape support devices, PACU extenders and arm boards, and surgical hand tables. Articulating head section also provides enhanced patient positioning and versatility. Key mobility features include the Steering Plus™ system for crisp cornering and control, dual-locking four-wheel brakes an integrated IV pole transport device. Heavy-gauge, automotive-grade steel reinforced frames provide both long-lasting quality and a 700 lbs. weight capacity to handle patients of varying sizes. Our Completely Refurbished 1068 Eye Surgery Stretcher features Height Adjustable Head Piece: +/-3º, Head Piece Tilt: +/-45º, Knee Gatch. Articulation: Trendelenburg / Reverse Trendelenburg+/-18º , and Fowler 0º to 90º. Patient Weight Capacity is 500 lbs. and Side Rails are 13″ x 55″. The 1068 has Maximum Patient Weight Capacity of 500 lbs. The Stryker 5051 Stretcher Chair is medical equipment offering multiple positioning options for greater versatility. Placement of the chair to horizontal position helps achieve improved clinical performance and patient comfort . Articulation and dual headpiece – enhanced clearance allows the unit to be configured from a chair position to a fully supine position for optimal surgical positioning. Ideal for surgery centers and medical facilities with limited space. • Horizontal positioning combined with dual hydraulics and brakes on all four wheels for versatility and exceptional pedestal stability.